The Cowgate barrier to the south of the Old Town ridge in Edinburgh prevented development of the southern suburbs. In 1785 the South Bridge Act authorised the construction of a bridge to address this. The contract to build it was awarded to stone mason and architect Alexander Laing in February 1786. Plans by Robert Adam having been rejected as too elaborate. The South Bridge Foundation stone was laid on 1st August 1785 by Lord Haddo, Grand Master Mason of Scotland. It was a monumental engineering project. The expanse of South Bridge was 1000 feet. Its’ highest point was only 31 feet above the ground. It penetrating the bed rock by 22 feet. South Bridge was to open for traffic in July 1788. For the opening ceremony Edinburgh Council chose the oldest female in the town to be the first to cross it. A problem ensued. She died before the day of the ceremony! Rather than chose the new oldest person in Edinburgh it was decided instead that the coffin of the deceased old lady make the ceremonial crossing. Witchcraft had only been fully condemned to the pages of history earlier that century. The act of a deceased individual opening South Bridge resulted in many inhabitants viewing the bridge as being cursed. Initially they refused to cross it! 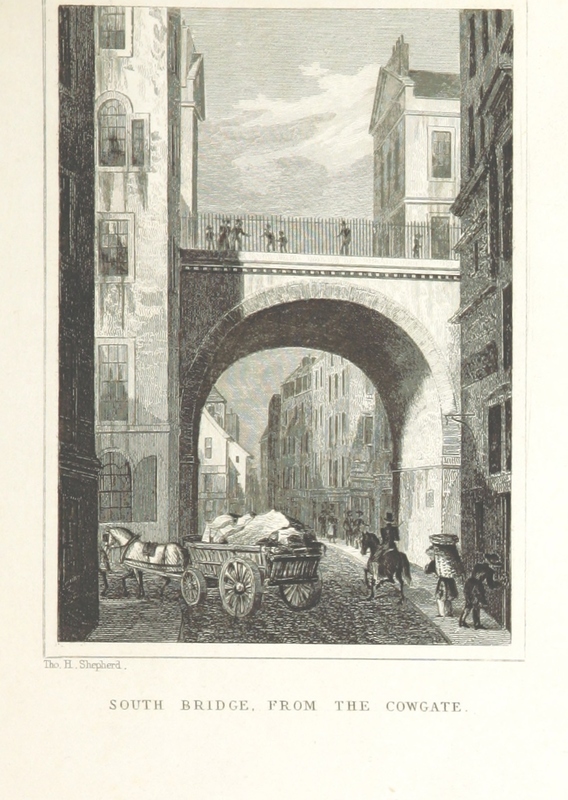 South Bridge comprises 19 arches. There is only one arch you can see, which is from the Cowgate. The vaults within the other arches originally housed taverns, cobblers, a distillery and other trades. These vaults also afforded housing for the poorest people in Edinburgh. The vaults were soon abandoned however. This was because of rooms without windows, lack of sanitation and dampness. During Victorian times the vaults were filled with rubble. This was to discourage nefarious uses. They were rediscovered by former Scotland rugby star Norrie Rowan. He excavated the rubble by hand, eventually enabling him to opened The Caves and the Rowantree bar venues in vaults south of the Cowgate. Norrie’s rugby friends were numerous across the world, including former Romanian internationalist Cristian Raducanu. Norrie enabled Cristian to evade capture by the Romanian Secret Police by using a trapdoor within the Tron tavern. This led to the South Bridge vaults. Another section of these vaults can be accessed from Niddry Street in the Old Town area of Edinburgh. 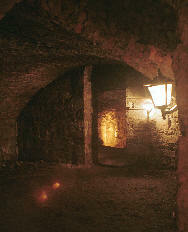 The dimly lit cellars from the 1700’s provide a perfect atmosphere for ghost tours, which Mercat Tours provide. I am really enjoying your accounts. I come across to Edinburgh every few months and explore it a bit more, but there is so much more to lure me. Thank you Jeremy. When you are back in Edinburgh sometime, should you fancy a tour do please e mail me; frasergolf93@gmail.com I promise to respond within forty eight hours. With the exception of Deacon Brodie, my focus has been and will be on more unusual historic tales of Auld Reekie. I am currently producing a list for future blogs from the index of two very old books. It looks dynamite! I can’t wait to complete the list and start writing on my findings. Hello again Jeremy! You commented on most kindly on my Edinburgh articles. I have started my own tour company this year and would be delighted to welcome you as a customer on any of the tours you can now see on this website.